The Proponent of the Sale champions the sales. The Salesperson must equip this champion with all the tools to convince the other stakeholders to pursue the transaction. The Opponent of the Sale objects to the transaction. Opponents of the Sale exist in almost every software sale. Many different reasons fuel opposition to a sale. A head of engineering may prefer to build a technology in house. A head of finance may disagree with the financial benefits. A team lead may suffer decreased staff, decline in power or reduced importance reduced as a consequence of new software. The Decisionmaker is the ultimate person who must be convinced to invest the dollars to buy the software. The Decisionmaker may often have different perspectives than the Proponent of the Sale. Often, the Decisionmarker is the CEO or CFO. The other stakeholders vary by product, price and sales process. They can be other people and teams who are impacted by a new product: IT may have to integrate new systems. Marketing and Sales may have to change their internal processes when deploying a new CRM. 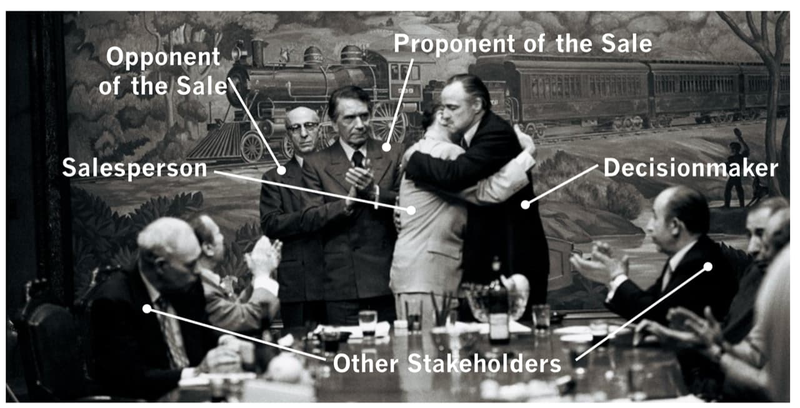 The last person is the Salesperson, who as depicted above, must build as strong a relationship with all the key holders. Understanding the relationships in the sales process is key to creating a playbook. Scaling a SaaS sales process starts with mapping out the relationships with the key stakeholders.